Molly Ann Fulkerson, Local Manila Woman, Receives National Promotion to Supervisor with For Every Home Business. Manila, AR & Utah County, UT – November 11, 2009 – Becky Anderson, founder of For Every Home, is pleased to announce today that Molly Ann Fulkerson, of Manila, Arkansas, has earned the promotion to Supervisor within the For Every Home company. According to the For Every Home team, Molly Ann Fulkerson started her home party consultation business in October 2008 with Barbara Williams’ team and has since lead her own team to leading group monthly sales numbers. As one of the top For Every Home Consultants, Molly Ann is featured in the Fall 2009 issue of Celebrating Women magazine. According to Molly Ann, For Every Home provides soy-based candles with specialty toppers and home décor at a wonderful price to women who want to buy a quality product. But more importantly, the company enables women to start their own home-based business as a Consultant and live their lives and to live their own dreams. You can meet Molly Ann Fulkerson and Barbara Williams, a Blytheville resident and choose from their beautiful candle and home décor custom designed holiday baskets at the Lit’l Bita Christmas Arts & Crafts Show November 13th -15th at the ASU Convocation Center. Or contact her at, mollyann@bscn.com or visit her website at www.foreveryhome.net/mollyann. In 2007, Becky Anderson founded For Every Home to help make a difference in women's lives. As the successful founder of a multi-million dollar company, she is using over fifteen years of experience to give women the tools they need to make their business successful. All of the products at For Every Home are created by Becky and her team. She watches trends closely to make sure everything offered is something women will love to have in their homes. At For Every Home, business and fun begin at home. Join the family! For more information please visit, www.foreveryhome.net or please contact: (801)-443-1961. Breast cancer is the second leading cause of cancer death in women after lung cancer and most of the women who have breast cancer know this. Online support groups for breast cancer can help you to obtain information to try and beat these odds as well as help you to overcome some of the struggles that you are facing. Online support groups for breast cancer has helped many people to understand what they are going through by chatting with others that have been there or are currently going through the same things that you may be. This list of online support groups for breast cancer can offer you many different advantages such as giving you a preview of what each site entails and if it is the right group for you. If you are looking for support that comes from far and wide then you have to check out this support group and donations are welcome. The donations go to keep up the website which I am sure that you will enjoy. It is free to join and you don't have to be a member to read through their comments, suggestions, and other parts of the site. Breast cancer is not funny but what is is their link to Take Your Daily Laugh Medicine that is posted by members of the breast cancer support group. The jokes are hilarious and without meaning too I spent around an hour laughing at things that wouldn't otherwise be funny. I believe that all breast cancer patients and survivors will fall in love with this breast cancer support group. This breast cancer support group is a smaller one but still meaningful. It is a place to share information on breast cancer as well as post your concerns and comments. There are some group goals that the members try to focus on such as being active in the forum and calling on each other for support during this difficult time. Both breast cancer patients and survivors are welcome in this breast cancer support group. Pink-Link is free to join and it consist of a network of people such as survivors, family members, medical pros, people who care about those with breast cancer, and current breast cancer patients. In this breast cancer support group you can ask questions, share your experience, search for information, share a resource and help one another through times when life doesn't seem fair. There are a ton of places that you can go for breast cancer support and now their is even an online resource to help you find a breast cancer support group that is local. A local breast cancer support group may be better for you if you are looking for local meetups or just want to chat with someone going through the same thing in your home state that can give you recommendations and help. This online support group is for women who have breast cancer or ovarian cancer. This website has a list of links, information, special events, and programs. You can chat with people who are going through some of the same things that you are and get support and recommendations to help you through it. Title: Have I really been married for 10 years? Every once in a while do you ever have those moments where reality just slaps you in the face? Boom! And you have to stop for a moment and realize where your life is at and how fast time flies. May was that kind of month for me. Travis and I celebrated our 10 year anniversary on the 20th and it was one of those days when I really thought about all that had happened in those 10 years and how fast time had gone by. In 10 years we've moved 3 times, had 3 children, battled breast cancer, made 3 job changes, dealt with psycho in-laws (Trav's side ;) ), put in 3 yards (NEVER again), driven 9 different automobiles, traveled to Kauai twice, laughed and cried and made incredible memories with our kids and the list goes on. After Trav and I sat and discussed everything, we both were overwhelmed with how many blessings we've been given over a 10 year period. The fact that we found each other to begin with was a HUGE blessing. When I was serving a LDS mission in Michigan I wrote a list titled 'I want to marry a guy...' On the list I wrote everything that I really wanted to have in a husband. I wanted a guy that would take me hiking during the day and to the opera at night. I wanted someone who was good with kids, someone who would make me laugh and someone who would fit into my family well. When I was finished the list totaled around 39 things that I really wanted to have in a husband. Now - being that I'm a smart girl and had dated many a guy in the past - I knew I was really insane to think I'd find someone that fit all 39 items. Then I met Travis. And there are only 3 items on the list that he didn't comply with. He can't sing, he can't dance and his mother hates me. (But we'll save that for another post - long story) I'm not saying that Travis is perfect - but he's perfect for me. I truly feel blessed to have him in my life and for his strength and willingness to stand by through the whole cancer episode. Thanks hun. I'm so grateful to have 3 wonderful children who, despite all the whineing, are really good kids. They are my greatest accomplishment. I'm grateful to be alive to celebrate my 10 year anniversary and I'm planning on going on a HUGE trip to celebrate my 50th anniversary. Time really does goes quickly and now that I'm older I can really appreciate all the times my mom said - Don't try to grow up too fast. I'd suggest taking some time today to think about all the wonderful things that have happened to you in the last 10 years. Don't worry about remembering the bad moments, leave them in the past. Just focus on the good times and I know you'll be smiling as the happy memories replay in your mind. Question: In addition to mammograms, are there other types of scans or tests that can be done to detect breast cancer? Answer: Other tests, such as an ultrasound, can be useful, not in screening, but to determine whether or not a mass in the breast is a cyst or a solid. MRIs of the breast are being used more commonly, especially in women who are at a high risk for breast cancer, such as those who have one of the genetic predispositions or women who have had previous breast cancers in whom we are questioning the results of a mammogram; MRIs may be helpful in this setting. But at this particular point, mammograms are still the best screening test for breast cancer. Proof that Breast Cancer can affect anyone. A 10-year-old California girl is battling a disease many girls her age have not even heard of: breast cancer. Fifth-grader Hannah Powell-Auslam of La Mirada, Calif., was diagnosed just over a month ago with Stage IIA invasive ductal carcinoma, her parents write on the blog. The diagnosis was later changed to invasive secretory carcinoma, a related cancer that is more slow-growing. Both forms of cancer are extremely rare in girls of Hannah's age; cases have only been documented in a few hundred girls in this age group. The American Pediatric Surgical Association reports that less than one-tenth of one per cent of all breast cancer occurs in children or adolescents. Hannah was diagnosed after complaining to her mother of an itch on the side of her chest. When her mother checked the area, she found a lump and made an appointment with the girl's doctor. Doctors told Hannah's mother that there was little chance that the lump would be cancerous but ordered an ultrasound anyway. The doctors were wrong. The ultrasound revealed a tumour in the girl's breast that spanned nearly two inches. "I didn't really know what cancer is. I was just crying and I couldn't stop," Hannah told local newspaper, the Whittier Daily News. Hannah has now had a partial mastectomy to remove the tumor. Because juvenile secretory carcinoma is rare, there is little good data on it. However, it is thought to be slow-growing and less aggressive than adult cancers, and patients usually have an excellent prognosis. Hannah's doctors say it appears her cancer has spread into her lymph nodes. She is scheduled to have a second surgery and may undergo chemotherapy. Hannah's family has started a blog, called OurLittleSweetPea.com, which has been overwhelmed with traffic since the girl's story began making headlines this week. The 13th annual Komen Salt Lake City Race for the Cure will be held on Saturday, May 9, 2009 at The Gateway Mall at South Temple & 400 West in Salt Lake City, Utah. The 5K (3.1 miles) run and walk and the 1 mile fun run/walk will start at 8:30am at a new start line. Both events will start on 300 W & North Temple heading north, and coming back to end near the Gateway Legacy Fountain. This is a great event to help support The Susan G. Komen Breast Cancer Awareness Fund. Komen Affiliates award grants to local hospitals and community organizations that provide breast health education and breast cancer screening and treatment programs for medically underserved women. Remaining net income supports the Komen Award and Research Grant Program, which funds groundbreaking breast cancer research, meritorious awards and educational and scientific programs around the world. There are many breast cancer survivors, friends and family members that turn out to this event to celebrate their lives and to contribute to finding a cure for this disease. Please help in the fight against breast cancer on Saturday, May 9th! You can still register the day of the event! Think Pink for Life began as a forum for breast cancer patients to share stories and inspiration with one another; a community of family, friends and fighters, working together to bring attention and awareness to a disease that has changed life for so many. In 2007, after reading through the stories that were shared, For Every Body selected one woman to become the first ever Think Pink for Life Honoree. Kellie May, a middle school teacher and mother of two sons with special needs, was presented with $10,000 as well as numerous other items and services from dozens of generous local sponsors. 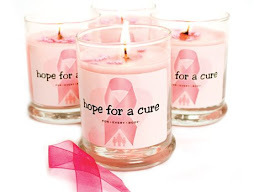 All of the proceeds from the sales of these plumeria scented candles go towards breast cancer awareness. Currently, we are searching for stories from anyone affected by breast cancer. If you have been diagnosed with breast cancer, are a survivor, or have lost a loved one to this disease, please share your story. Until August 1, 2009, please visit http://www.ithinkpink.org/. Kardashian Sisters Choose For Every Body Candles!